The 2018 Jaguar XF, offered at our Little Rock dealership, is well-equipped in order to give drivers a top-quality driving experience. From the moment they get behind the wheel, motorists will be able to opt for a number of engine options, including both diesel and gasoline engines. The highly responsive eight-speed automatic transmission ensures that each drive is smooth, keeping drivers and passengers calm, cool, and collected. Taking a ride in this beauty is more like a treat, as it can brighten up the gloomiest of days. Hitting the open road with the XF is a rush of adrenaline in itself, but sitting behind the wheel for the first time is exciting as well. From the moment onlookers lay eyes on this beauty, they will be wondering how they can get one for themselves. This vehicle comes in two styles: the Sedan and Sportbrake. While each has a sleek, sharp, and aerodynamic design, the Sportbrake is a great fit for travelers who need their more interior space. Whichever body style is chosen, the lightweight aluminum architecture and sophisticated interior gives motorists a driving experience like never before. Each Jaguar model is equipped with an impressive number of top-technologies, especially the 2018 Jaguar XF. 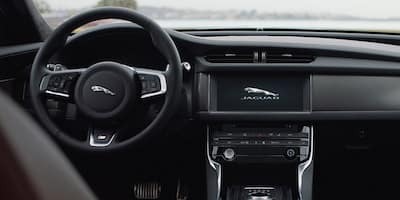 With intuitive technologies like the Head-Up Display and Jaguar InControl® suite, travelers will have all they need at the tip of their fingers. Being able to stay connected while remaining in control is very important, and Jaguar allows drivers to do just that. For those who enjoy music, the available Meridian™ 825W Surround Sound System gives listeners an unbelieveable hearing experience. As if the ride wasn’t enough, the Little Rock Jaguar specials are out of this world as well. When behind the wheel, every driver deserves to have peace of mind knowing they are in good hands. At Little Rock Jaguar, we work hard to ensure each motorists feels safe when they enter their ride, and the 2018 XF can help with that. Thanks to a number of practical safety features like the available Emergency Braking system, travelers can take to the road knowing they are protected at all times. There are many features that keep drivers aware of their surroundings, making sure the only thing they have to worry about is how shiny their car is looking. For more information about the 2018 Jaguar XF, contact Jaguar Little Rock at (833) 664-6125 to schedule a test drive. We also serve the Benton area, so come on down and let us show you what true customer service looks like!